HIFU stands for high intensity focussed ultrasound. It is the method invented by Ulthera to tighten and lift sagging, crepey skin. The HIFU technology was patented and developed by ULTHERA in the United States of America. It is the only HIFU that has FDA and both TGA approval world wide. It is the only HIFU that has clinical papers and research which shows long term results. There are many fake Ultherapy devices and many copy HIFU units coming particularly out of China which are dangerous and at best give inferior results. If you are after superior results and safety please ask your clinic to show you their certificate of authentication and check that they are listed on the official Ulthera Website as having been approved by the manufacturer as being a bona fide clinic. 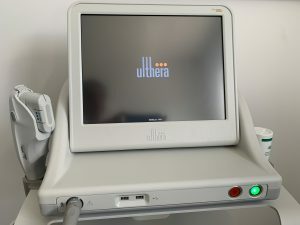 Ulthera is the gold standard in High Intensity Focussed Ultrasound Therapy. There is no alternative HIFU system that works better.